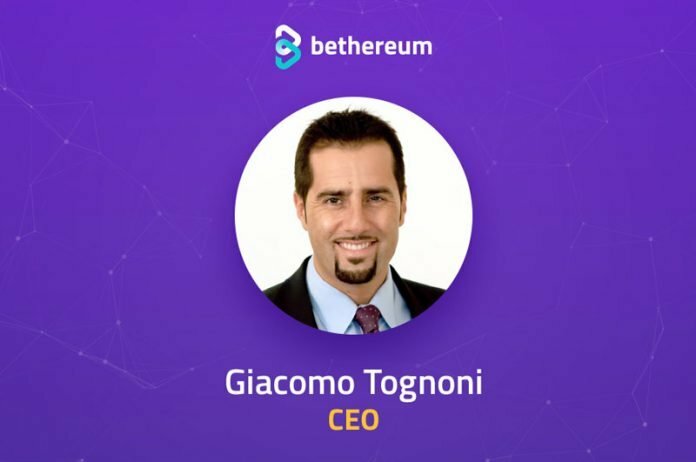 Giacomo is the CEO at Bethereum, an innovative social betting platform built on blochchain technology. A marketing and gamification expert with C-level background in corporates and startups, he has over 20 years’ experience in Telco, IT, and mobile gaming. Bethereum successfully sold out their presale of 6000 ETH and their main sale will start on June 28. Q: Hi Giacomo! Thank you for joining us today. Can you tell us more about yourself and the Bethereum project? A: Sure. I worked most of my career leading marketing and strategy teams in Telco and IT, lived in 10 countries, and eventually decided to enter the startup world. Gained experience in mobile gaming for 3 years, started as an advisor for Bethereum, loved the project and joined the team as CEO. Bethereum is a truly special blockchain project, I believe. We’re trying to do something real and with solid business fundamentals, in a market worth over a trillion dollars. Essentially, Bethereum leverages blockchain technology and gamification elements to deliver the most secure and engaging betting platform in the market. The project solves some of the main challenges in the betting industry. In conventional operations, over time the House always wins. Odds are greatly in favour of bookmakers. There is a general lack of transparency and trust, high fees and low returns, and low social involvement. We can provide full transparency of security by using a decentralised solution, automatically regulated by Smart Contracts. But we also want to bring fun and social back to betting, and to deliver the most intuitive user experience in the business. So we’re adding social and gaming elements (such as achievements or leaderboards) and make sure everything is as user-friendly as it should be, also for those new to betting. Q: Could you describe briefly the Bethereum business model? A: We have both a consumer and business angle. The consumer angle is mostly about our social betting app. Players bet with friends and other players, for example on sport matches, all bets go into a winning pot distributed to the winners, and we take a small fee from this pot. The business angle includes a white-label solution of our technology, for example for conventional betting operators wanting to get into crypto. Pricing models will be ad-hoc for this kind of solutions. We also provide third-party developers with the possibility to integrate games into our platform. We put the branding, reputation, secure technology and player bases, and developers provide content – for example casino or poker games. Our BetherNet betting protocol and Developer SDK make it easy for them to integrate the games and set up the Smart Contracts, and we can operate on a fully transparent revenue share model. The whole solution is fuelled by our Bether token. The token is used to handle all the bets and transactions on the platform, and to pay commissions to third-party developers and part of the affiliates. Players will be able to obtain it on major exchanges or in return for fiat and other cryptocurrencies through our Bethereum wallet. Q: What are the main differences between conventional betting and Bethereum? A: The simplest difference is that in Bethereum you bet with friends and other players, not against a bookmaker. You’re also not playing against complicated odds with hidden margins: players set the odds. But in general, the online betting industry is plagued by a number of challenges. Odds are vastly in favour of bookmakers, payouts are not always honoured, and regular winners are restricted or banned. There is a lack of transparency and security, many hidden fees, and low social involvement. These factors alienate a significant number of potential bettors from taking part in such systems. Blockchain and Smart Contracts enable us to offer a decentralised betting platform, essentially cutting out the middleman (the bookmaker). In addition to generating cost savings vs. traditional centralised solutions, the technology allows us to provide a safe, transparent, and trusted solution. On our platform, every bet is handled by a Smart Contract. The smart contract records the conditions for the bet, keeps the funds in escrow, verifies the bet outcome via the use of Oracles, and automatically pays out the winnings. All without any human intervention or possibility for manipulation. But we are not just harnessing technology to create a safe, transparent betting platform. We are adding a number of innovative features, some of which borrowed from the mobile gaming and social media sectors, to offer a truly rewarding and fun experience. Q: How do you plan to scale the Bethereum ecosystem? A: First of all by building a solution that players and businesses truly want to use. Then by growing a community around it. There is no substitute for community support and viral marketing when it comes to cost-effective adoption. We have already proven we know how to create strong social engagement, and have one of the largest and most active community in the blockchain space. Beyond that, it will be about partnerships, PR, affiliate marketing, and standard organic and paid user acquisition. We’ll start on the consumer side, and set up a business development team for B2B growth in a second stage. Q: Tell us about the token presale politics (dates, terms, discounts)? A: The presale is over, and successfully sold out. We kept bonuses relatively low, to mitigate any possible token dumping once we hit exchanges. The main sale starts on 28 June. We’re finalizing the bonus structure now, but should open with around 15%. A: We already have an MVP on the App Store, and have received a huge success with our web-based community betting game (nearly 20K bets placed in about a month). We’re just launching the World Cup edition of our community game, with major prizes and free for everyone to play (at worldcup.bethereum.com). We expect it to be a real blast. It’s all already running on the blockchain and with Smart Contracts. We’ve been working on Bethereum for over one year. Development of the platform took a pause in this period as we had to focus on the token sale, but we’re starting to get back into design and development, and also hiring top people to continue the journey. And I am optimistic we can stay close to our intended roadmap. Q: What makes the Bethereum project different from other blockchain based betting or gambling projects? A: First of all, we already have a prototype: many other projects are just about an idea. Other than that, we worked hard to carve a unique position within the space. Most blockchain-based betting solutions are focusing on developing something which is already available in a conventional form, and using blockchain technology to provide this “something” as a safer, transparent, and cheaper solution. Some focus on football or sports, some on eSports, others on fantasy sports, for example. This is all perfectly valid…but difficult to differentiate and in case of anything but sports, restrictive in terms of potential market size. Other operators are focusing on developing a betting currency, which will then be used by “everybody else” in the industry. This is their main focus and while they are interested in developing some own platform (with dubious profitability potential), most of the effort is placed on growing the adoption of their digital token. We think both directions are too restrictive. Just making something which is already available off the blockchain more secure and transparent is a great and necessary improvement, but not enough to give a betting operator an edge. Having a vision of establishing a widely adopted betting currency is certainly alluring but hard to execute if there are no powerful drivers driving such adoption. We aim at delivering the most intuitive and engaging betting application in the market, supporting content from sport betting to eSports and even third-party games (e.g., casino). But we’re not limiting ourselves to a “fancy” sportsbook on the blockchain. Our vision is to develop a broad B2C and B2B ecosystem and to establish our Bether token as a global betting standard. For this reason, we are creating a platform catering to the needs of a broad consumer and business base, all fuelled by the Bether token. Q: Tells us about the Bethereum app prototype, what objective did you have in mind when you built it? A: This was built before my time at Bethereum. It’s a nice start, we got a lot of positive feedback, but I believe we still have much room for improvement in terms of UX streamlining and betting design. More interesting is the web-based betting game we created for our community. It’s over simplified as we wanted to make it as intuitive as possible, but already shows a lot of promise. Since we started with blockchain support from day one, this will be the base for further platform development. The objectives were and are very simple: to create the most intuitive and engaging betting application in the market, and eventually be recognized as a major and fully trusted operator in the betting business. Q: What has been your biggest challenge so far working on Bethereum? A: Too much work, too little time 🙂 Other than that, everything is great, and the support and recognition we get from our community, rating experts, and contributors is so amazing that we don’t mind working around the clock to deliver what we promised to all of them. We recently got into the top finalists of ICO Race, probably the most prestigious blochchain competition of the year, with over 150 applicants and the largest prizes in crypto ever. This is also the kind of feedback that makes us push forward and get us hungry to deliver. A: Right now, conclude the token sale successfully. Our vision is ambitious and funding is important. Immediately after, deliver on our promises. That means proper planning and strategy but mostly superior execution. We have a lot of people who trust us and we need to make sure that trust is repaid. Q: Tell us in one sentence what the aim of the Bethereum project is. A: To deliver the most engaging betting platform on the market and a real, successfully company behind that. A: Define “life”. Well, running a blockchain project and a token sale is a demanding task. The whole team works non-stop on Bethereum, so not much time for anything else. As for me, I try to make sure we all keep well aligned on priorities and tasks, that task ownership is clearly defined and execution happens well and on time. My day is a bit of a juggling game in between strategic activities and operational tasks, and it ranges anywhere from marketing to analytics to site design to copywriting to strategy and contributor relations and much more. That’s startup life. Sometimes hard, yes. But never dull, never boring.